If you build things when you go to the woods -- like primitive shelters or smoking racks -- or even if you just like to cook over a natural wood fire, any axe is better than a knife. The power of the swing focuses on a smaller cutting edge, making short work of what would be a major job with a knife. With a practical axe along, you can save your good knife for finer work. With a full weight of only one pound, the high carbon steel Paxe isn't heavier than the usual full-sized Bowie knife, and the 8.9-inch overall length lets it fit easily into backpacking gear. The Paxe's wrap-around handle of fiberglass-filled nylon won't work loose if used properly, making this build nearly indestructible in skilled hands. Shortcomings are simply that it's a short axe without much power behind it, and if you aren't careful and do miss a swing, you may smash your knuckles instead of the handle. Swinging harder isn't smart -- use the Paxe for small jobs and depend on the weight of the axe head to do the work. If you swing short with this small hatchet, the blade could arc very close to important things like your legs. A full-sized axe actually gives you a better safety margin. Few of us care to pack a full-sized axe into the high mountains, but the Gerber Paxe is just enough axe to make that challenge tempting. The Paxe comes with a ballistic nylon belt sheath to make storing or carrying the tool even simpler. 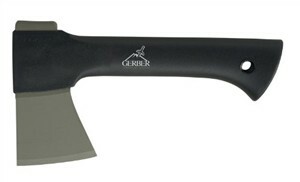 See the Gerber Camp Axe for a larger version of this pack tool suitable for anyone able to carry heavier gear.